The ‘Wanted’ section is often full of interesting and odd requests. Which is why it isn’t exactly the first place one might think of when seeking a friendly hug – until now. 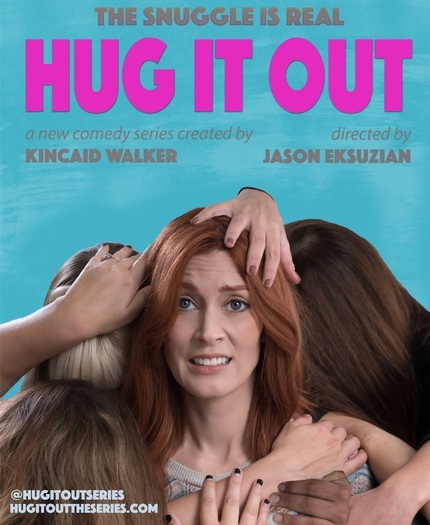 Apparently professional cuddling is a real vocation and actress/creator Kincaid Walker has turned the unbelievably awkward occupation into the new web series HUG IT OUT. The 6-episode series follows a newly divorced woman re-starting her life in Los Angeles. Desperate for a job, she steps into the professional cuddling business, helping some unique clients and growing into her new life one hug at a time. To direct the project, Kincaid turned to Jason Eksuzian, who had directed her previously in the critically successful digital series DINKS. HUG IT OUT will have you laughing, squirming and wondering where you might get a platonic hug of your own. Kincaid Walker and Jason Eksuzian recently answered a few questions about the new series. Why did you want to create HUG IT OUT? KINCAID: As a female, first-time series creator, I was eager to find a vehicle that felt personal, weird, funny and tender. I’ve always been an introvert and as such, a bit shy and uncertain about connecting with new people — so I wanted to create a main character, Gwen, who had similar attributes and then put her in the worst (and best, of course) situation to confront these tendencies. I first encountered professional snuggling in an article in The Atlantic. I could see the inherent comedy in such a strange gig, entering strangers' homes to cuddle for eighty bucks an hour — and also that that would be pretty much Gwen’s nightmare. And I guess in general, in these odd, often intense, times we are living in right now where I think despite all the social media, etc. it is easy to feel very disconnected, I wanted to create a comedy series about that intrinsic human need to be seen without pretense by someone else and to, well, “hug it out”. You’ve got some funny people it in with you, tell us about the casting? JASON: The series was made in conjunction with SAG and we were extremely fortunate to have such top-notch talent! I had worked with Kincaid before and as expected, she is brilliant as Gwen, but when you get to direct amazing actors like Parvesh Cheena, Mark Kelly, Jeff Torres, Riley Rose Critchlow, Blythe Auffarth, Liam Sullivan, Kirstin Eggers, Cindy Drummond and David Fickas...well that makes the job pretty easy. One unsung hero of the project is definitely Brice Beckham as Oscar, who only appears as a voice on the phone in each episode, but really brings layers and range to the character. KINCAID: Absolutely, I couldn’t agree more about our fantastic cast. We were thrilled to be able to assemble such generous, talented pros for this series. They each brought so much nuance and comedy to their roles; there were more than a few times when a take ended in my outbursts of laughter at their hilarious work. Did you set out to make a series about humanity or just something humorous? KINCAID: Initially I was caught up in all the silliness and awkwardness that was possible in a show about pro-snuggling — all the oddball people Gwen could meet, the crazy situations she could into with each of them. But honestly, when I dove into the idea, I also loved her having to connect with people who were feeling vulnerable, lonely, disconnected — whether that was a war vet, a former nudist, an agoraphobic or a very depressed woman who needed something that was just for her, separate from her family and young kids. I love that when a lot of people have seen the series, they’re initial thoughts about professional snuggling were, “What the what?! Is that a real thing?” — and then after they watch, they end up really caring about the characters. I like that the humanity of it kind of sneaks up on you. Any awkward moments on-set from all that hugging? KINCAID: Mostly only awkward within the context of the story — fortunately, I guess, ha! My character Gwen — particularly in the first episode which is her first day as a professional snuggler — feels very awkward having to, say, hunker down in a character’s cramped pillow fort and spoon him in the “happy turtle” position (not a real snuggling position, by the way, but maybe it should be!). But all of the actors were real troopers about having to be snuggled in various configurations by me! JASON: And as a reformed non-hugger, I'm still working on my technique. I stepped on a lot of people's feet when coming in for a hug. It's going to be a long road but I'll get there! KINCAID: Yeah, I don’t think Jason’s gonna be taking on a side-gig as a professional snuggler anytime soon. But I guess you never know! JASON: Kincaid took a chance on me a few years ago and starred in a little web series I created called DINKS. I love working with her and was so thrilled she asked me to collaborate on this! KINCAID: And I was so thrilled Jason said yes! We had such an outstanding time making DINKS. As a director, Jason creates a wonderful “team spirit” with his cast and crew, and he provides this great sense of comfort and freedom to play and take chances — something that is so essential in comedy. And making HUG IT OUT with him, I got to experience what’s he like as a producer, and it was such a pleasure all the way through, from his early thoughts on my scripts to the post-production process. I certainly hope we get to make more projects together. Biggest piece of advice you wish you would have followed. JASON: Don't shoot at your own house. I don't know about Kincaid (because we shot at her place as well as mine) but there's a weird feeling you get when you call wrap and the whole crew has pooped in your bathroom. KINCAID: Well gosh, I never thought about it exactly like that. Now, I’m going to try and stop thinking about that. And I guess for me, the piece of advice I wish I’d followed sooner was to make something like Hug It Out. I love being an actress in other people’s projects and I love writing scripts that I won’t necessarily be in as an actor, but marrying the two was a gift and challenge I could’ve certainly given myself before now. Best advice you actually followed. JASON: Get out there and produce work yourself. Don't wait around for someone to come calling. KINCAID: Absolutely. It can seem daunting having to figure out everything for yourself, but it is very worth it. If I had waited for someone else to be willing to fund and produce Hug It Out exactly as Jason and I wanted, well… I’d probably still be waiting. Did you ever think about giving up on the project and what stopped you? JASON: Never. I'm a firm believer that if I start the race, I'm crossing the finish line. It can be a real challenge along the way but nothing feels better than completing an idea. KINCAID: Yeah, we never thought about quitting. And honestly, yes of course there were moments of frustration with scheduling, locations -- all that sort of thing can be maddening sometimes — but on the whole, this project really came together pretty swimmingly. No complaints. Lastly…where do you go from here. JASON: I think Kincaid has a lot to say with this series, so I hope she keeps writing and I get to keep working with her to make something we can continue to be proud of! KINCAID: I hope I get to working with Jason, that’s for sure. And there are so many other ideas I have for characters and situations in Hug It Out, not to mention Gwen still has a lot of intimacy blocks she needs to confront. So my fingers are crossed for a second season.